Social media can offer a variety of benefits for a company when it is managed correctly. As more people begin to rely primarily on social media to communicate and share information with the world, businesses need to have clear strategies to capitalize on that popularity. In 2013, approximately 86% of marketers ranked social media as an important aspect of business. In 2014, that number had risen to 92%. Smart businesses understand that social media is the go-to way their consumers communicate and search for information, and the numbers back them up. In 2015, it was reported that Facebook had almost 1.5 billion active users on the platform. That’s 71% of adults who use the Internet. In the United States alone, the average Internet user spends approximately 37 minutes each day on various social media platforms. Facebook isn’t the only platform catching online users’ attention. Almost 23% of adults online use Twitter, and 28% have a LinkedIn account. These numbers are hard to ignore, and business owners who take advantage of social media are gaining access to a large community of educated consumers looking for companies to support. It takes a while to build a successful social media presence, no matter what platform you choose. Sharing a few posts and clicking a few likes isn’t enough. Social media users these days are educated, savvy consumers. If you want to catch their attention and gain their support or their business, you need to appeal to them in a way that makes you stand out above the crowd. At Salient Marketing in Ottawa, we understand what it takes to build a prominent social media presence online. We know how to create profiles and posts that appeal to consumers, and we know how to implement tested strategies that are proved to work for you. Social media offers an inexpensive method for reaching out to consumers. Most social media sites allow you to create an account for free, set up your profile, and begin interacting with consumers immediately. Facebook, Twitter, LinkedIn, Google+, and other sites offer the chance for real-time interaction as soon as you begin. If you want to invest some money in reaching out to new customers or boosting the visibility of your posts, there will be a fee, but it’s still considered a low-cost alternative to traditional marketing. If you don’t have the time to coordinate your social marketing strategy or don’t want to spend hours each week updating information, sharing posts, and communicating with potential customers, let Salient Marketing handle the process for you. From paid Facebook advertisements to customer outreach to link-sharing, the experts at Salient Marketing know how to manage your social media accounts successfully. We have experience on a wide variety of platforms and know how to customize your strategy for each individual platform. If you want a quick return on your investment, social media is the easiest way to get it. If you want to implement a targeted campaign to a specific audience, you can identify any one of the above parameters and set it to seek out those who fit your criteria. While these tools are fairly new in the world of advertisement, they continue to improve and offer more choices for marketing on social media. The ability to target your media means your money goes where you want it to, rather than being wasted on an audience that is unlikely to be interested on your specific product or service. Regardless of the type of ad you want to run, it takes experience to craft a detailed message that will appeal to your target audience. If it seems like a challenge to manage the many elements of a social media campaign, let Salient Marketing put its experience to work for you. Our social marketing campaigns can manage all your social media platforms, create quality content, and target it to the right people. We can build your web presence while boosting your reputation with consumers, driving traffic to your site, and interacting with potential customers on their favorite social media platforms. Staying active on social media is key to reaching people in this digital age. Let us do the hard work for you and look forward to the results we can bring. One of the most important parts of effective social media networking is analyzing your strategy and shifting it to account for consumer reaction. How many ad clicks lead to purchases? What’s the next stop for consumers after they visit my site? How many users get to my website by way of a social media campaign? Are my posts being shared on social media? How effective are my backlink strategies? What type of sites are linking to my business, and how can I improve them? Getting answers to these questions can mean the difference between a successful social media campaign and one that goes nowhere. Small businesses face an uphill battle when it comes to taking advantage of social media analytics. The time it takes to gather the information, understand it, and utilize it correctly can take valuable time away from running your business. Fortunately, Salient Marketing is here to help you manage these needs. Our teams have extensive experience in social media management, including analytics. 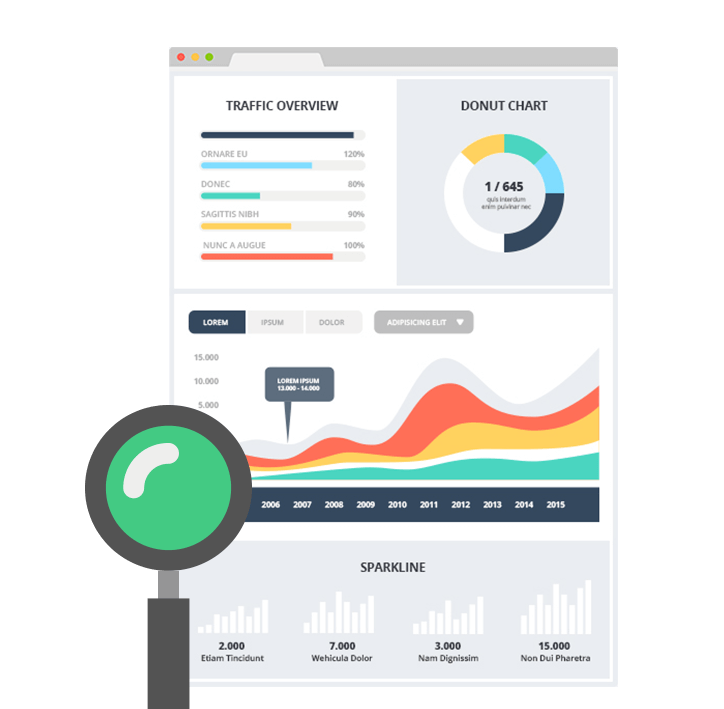 We understand how to break down the data and use it to create informed choices about your next marketing campaign. We know how to figure out what’s working, what isn’t, and what needs to be changed in order to boost your visibility and turn ad views into paying customers. We provide onsite and competitive analysis, along with proactive link outreach. These are designed to see how you match up with the competition to help you increase your brand awareness on social media. We know what it takes to reach out to popular websites and build a network of professional and authoritative links that will raise your reputation and increase your popularity online. While it may seem easy to connect with customers through social media, small businesses who want to compete with larger companies will benefit from hiring a professional to take their social media management to the next level. At Salient Marketing in Ottawa, our social media professionals keep on top of the latest trends, changes to technology, and popular methods for using social media. Salient Marketing is used to bringing its expertise and dedication to clients in the Ottawa area. Whether you are looking to reach out to new customers in the neighborhood or want to reach out across the globe, our experts know exactly what it takes to bring your business to the next level on social media. Contact us today to find out how Salient Marketing can help your business succeed.